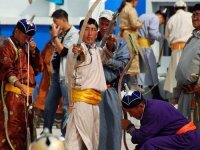 For many, Mongolia is the land of Genghis Khan but it's much more than that. Bordered by Russia in the north and by China from all three remaining sides, Mongolia is the world's second largest landlocked country after Kazkhastan. With very little arable land but vast grasslands with snow-capped mountains in the north and the west and the famous Gobi Desert to the south, Mongolia is an exotic destination for the travelers. Still more than 30% population live nomadic or semi-nomadic life in the ger camps and ride horses. 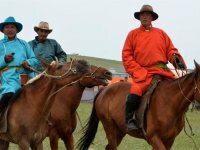 Majority of the population are of Mongol ethnicity and practice Tibetan Buddhism. 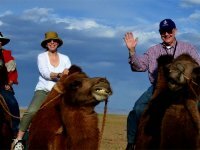 Our trips take you to the great Gobi desert, the vast grasslands and give you opportunity to mingle with the nomads. Majority of our tours are cultural but we also offer adventure and nature tours. 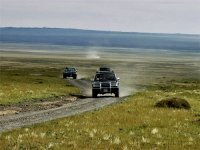 Mongolia has a vast array of places and sights to visit. Ulaanbaatar, the capital city of Mongolia is the gateway to the many interesting destinatios of Mongolia. The Currency in Mongolia is known as Tugrik pronounced as “too-grk” - Mongolian National Tugrik coded as MNT. Bank notes come in denominations of 1, 5, 10, 20, 50, 100, 1000, 5000, 10000, and 20000. US Dollars, Euros, British Pounds, Australian Dollars and other major currencies are widely accepted by hotels, tourist class restaurents and shopping centers. Choosing the right time in terms of weather and climate would be the key step to enjoy Mongolia travel at the fullest.Mongolia mostly experiences sunny days and rightly called as the 'Land of the Blue Sky' but, keep in mind that there are hardly any warm days. Mongolia experiences extreme continental climate; it is so far inland that no sea tempers its climate. When you start planning for your trip, the foremost step is to check the validity of your passport. 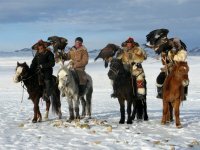 Mongolia requires that remaining validity of your passport must be minimum 6 months when you depart the country. You also need to make sure you are not running out blank visa pages. The main international airport is Chinggis Khaan International Airport (ULN) that is located about 10 miles southwest of the capital city, Ulaanbaatar. You can either go by air or by land to reach to Mongolia depending on your convenience and preference. There are not so many international carriers serving Mongolia, but you can make connections from major Asian capitals. While Mongolia has no mandatory vaccinations required for entry, it will be wise to plan well before your travel begins; some preventive measures will surely help you in the long run. It is important to discuss your existing illness with your doctor and aks for an International Certificate of Vaccination known as the yellow booklet, listing all of the vaccinations you have received, and take it along while you travel. Mongolia is one of the few destinations in the world where you can travel almost worry-free. It is indeed unlikely that as visitor you will encounter any safety issues. The country is politically stable and relatively safer than many other Asian countries. However, there still are things you need to remember.